The Atlanta Airport has invited Nancy to install a second exhibition in the fall of 2019. 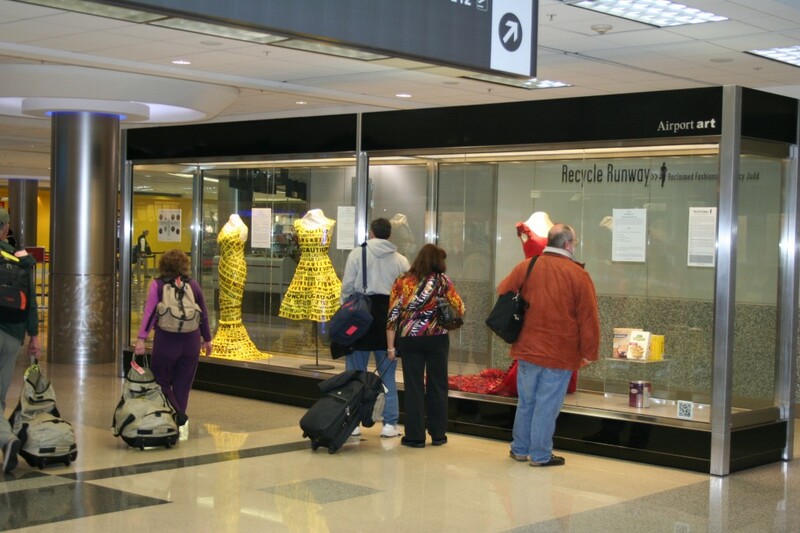 Read details about Recycle Runway II in ATL! 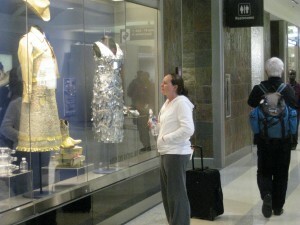 Twenty one of Nancy Judd’s eco-fashion sculptures were installed in ten cases located throughout international Concourse E from May 2011-June 2012. You can read blog posts about her midnight adventures installing the exhibition and a final report on the installation. You can also take the Eco-quiz and perform some E-activism that was a part of the show. The following video showed on the CNN channel at every gate through out the Atlanta Airport several times a day during the exhibition! Thank you to Atlanta’s Airport Art Program staff and the sponsors for making this exhibition possible!